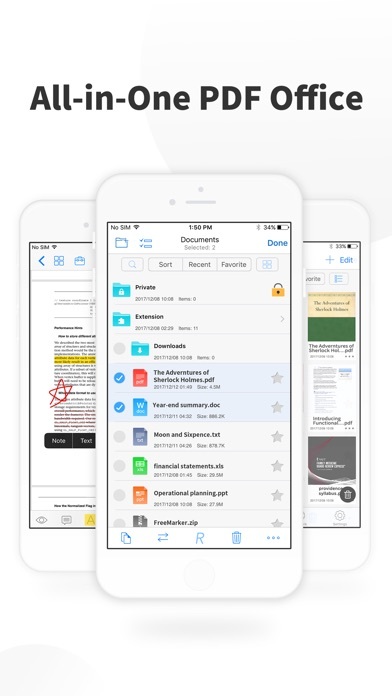 PDF Reader Pro is an essential app for anyone who reads, highlights, signs and fills out PDFs on their iPhone and iPad. 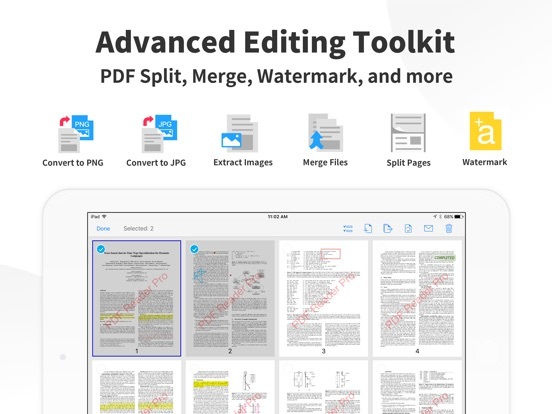 This full-featured powerhouse makes it easy to organize, annotate and edit your PDF library. 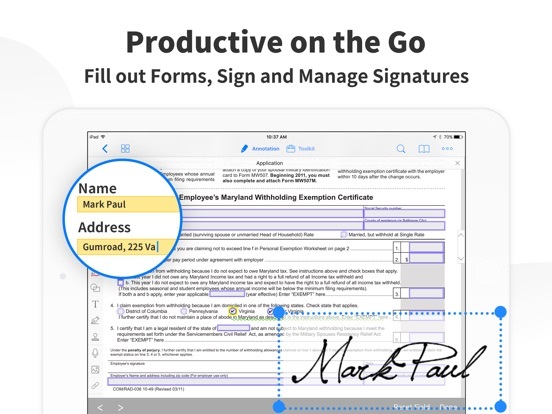 Import files from your computer or the cloud, then complete forms, add freehand drawings and audio notes and more. With support for reading files from popular productivity suites, it’s a convenient way to take the office anywhere you go. ・ Enable full text search, scroll, zoom in and out. ・Stamps - Insert predesigned stamps such as Approved, Not Approved, Confidential and more. ・Link - Now linking any part of the text to a different page or even a website is fast. 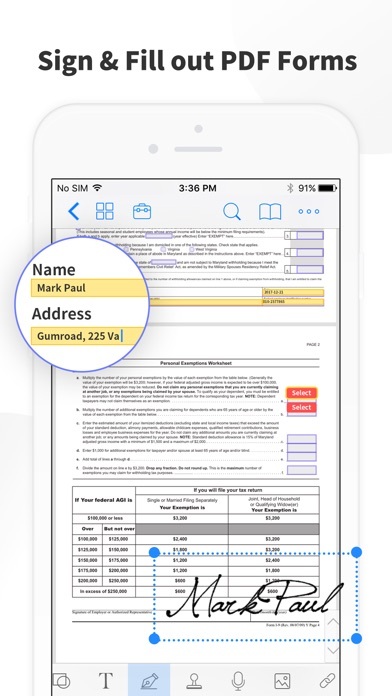 ・ Fill out any PDF forms with interactive fields such as text fields, checkboxes, radio buttons, combo boxes, list boxes and etc. ・ Convert MS Office documents, iWorks, web content, and images to PDFs. ・ Rotate, rearrange, append, and delete PDF pages. ・Watermark - Add fantastic watermarks to keep your documents safe and professional. ・Flatten - Flatten PDF to make the contents static. ・ Passcode - Restrict access to PDF Reader with a password. ・ Encrypt - Protect your files from unauthorized reading with a password. ・Make continuous scans and automatically detect edges of scanned objects. 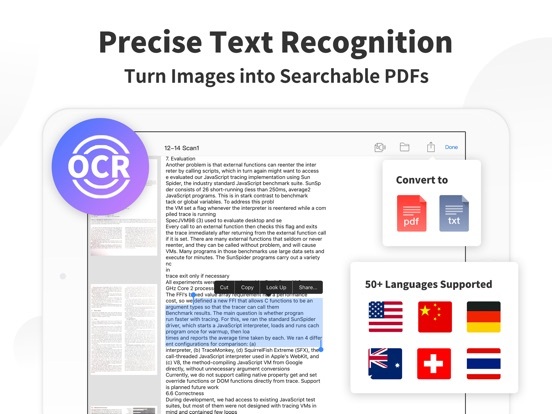 ・Turn scanned images into searchable PDFs or TXT files. 50+ languages supported! ・ Support a total of 36 voices for 26 languages. ・ Store and secure files on Dropbox, OneDrive, Google Drive, Evernote, Box, FTP, WebDav, etc. 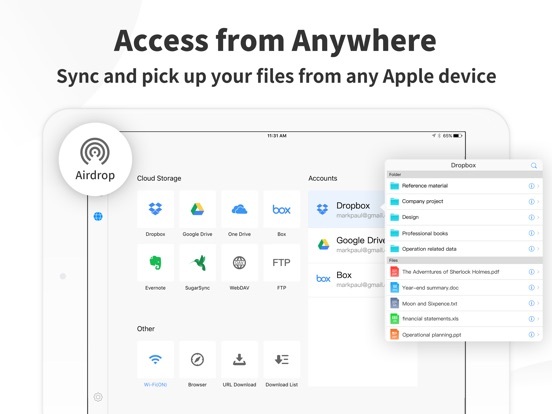 ・ Connect your iPhone/iPad with desktop for transferring files using USB or WiFi connection. 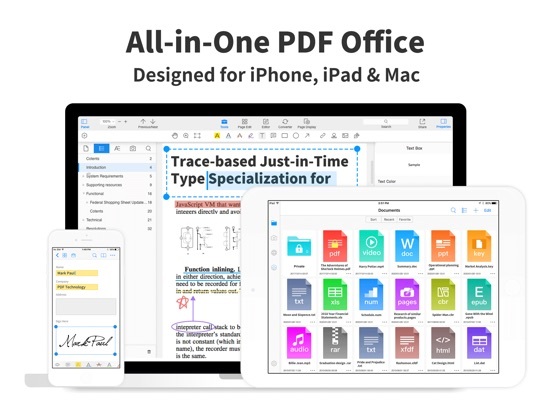 MAKE THE BEST OF PDF READER PRO, AND TONS OF OTHER FEATURES! 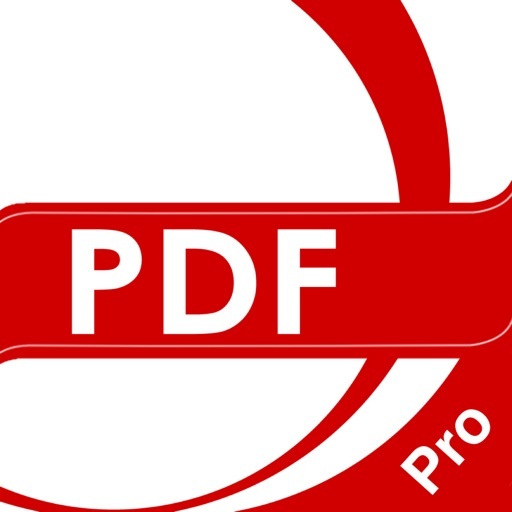 If you want to thank our tireless team, please write a review or recommend PDF Reader Pro to your friends! ・ Apple Pencil 2 support - Use “double-tap” to switch between undo, redo, and color palette when freehand writing. ・ Fixed the issue on connecting to OneDrive. 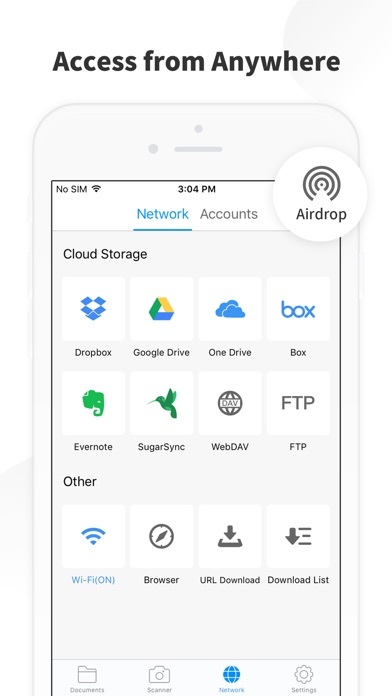 ・ Gain access to the files on Dropbox by tapping the “+” button. ・ Now you can fly through PDFs with the new iPad Pro faster performance and the edge-to-edge display. 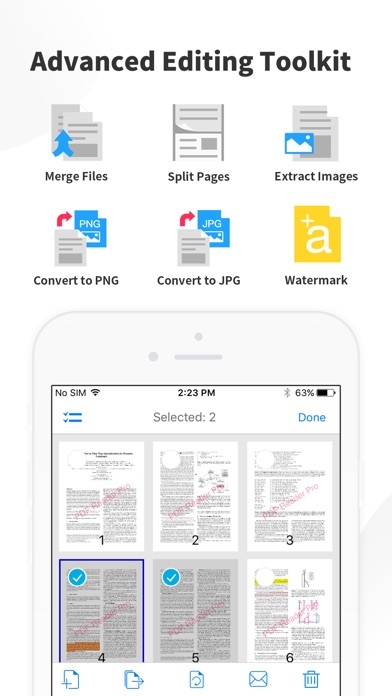 ・ Files app supported - Directly access and view files stored in PDF Reader Pro using the Files app. If you want to thank our never-resting developers, please write a review or recommend PDF Reader Pro to your friends and teammates. We wish you a happy Spring Festival! Keep the feedback coming at [email protected] and stay tuned!